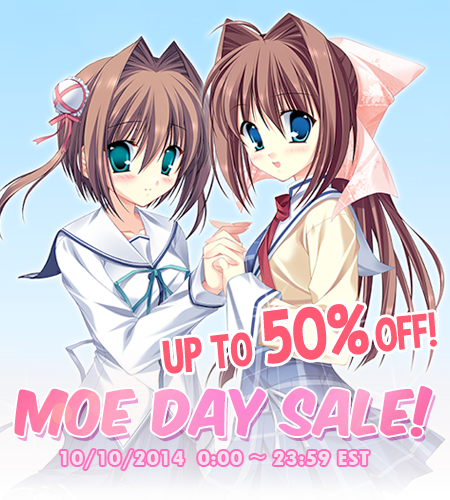 What is Moe Day, you ask? Which visually resembles the Japanese kanji for moe! In commemoration of this day, MangaGamer is putting eighteen of some of our most popular titles up for sale for 24 hours on October 10th! Da Capo $29.95 → $14.98 50% off! Trial available! 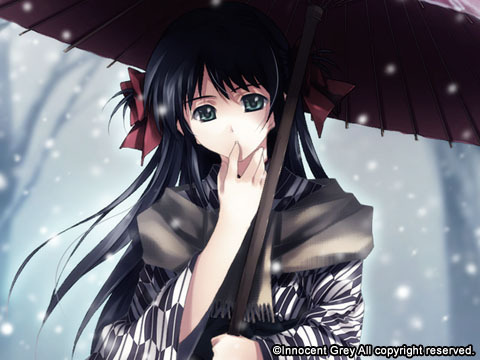 Da Capo Innocent Finale $19.95 → $9.98 50% off! Kotori Love Ex P $34.95 → $17.48 50% off! Da Capo 2 $44.95 → $22.48 50% off! SHUFFLE! $39.95 → $19.98 50% off! Tick! Tack! $34.95 → $17.48 50% off! Trial available! Really? Really! $34.95 → $26.21 25% off! Trial available! Harukoi Otome $49.95 → $24.98 50% off! Demon Master Chris $16.95 → $8.48 50% off! Trial available! Otoboku $44.95 → $22.48 50% off! Edelweiss $29.95 → $14.98 50% off! Trial available! Edelweiss Eden Fantasia $19.95 → $9.98 50% off! Edelweiss Bundle $39.95 → $19.98 50% off! Kira Kira $29.95 → $14.98 50% off! Kira Kira All Ages $19.95 → $9.98 50% off! Trial available! Kira Kira Curtain Call $19.95 → $9.98 50% off! Kira Kira Bundle $39.95 → $19.98 50% off! We Love Master $29.95 → $14.98 50% off! This sale will last 24 hours, from midnight till 11:59PM in US Eastern Time on October 10th! And while you’re visiting our store, check out Cartagra ~Affliction of the Soul~, releasing on October 31st with a trial available for sampling and preorders open now! Tagged Baseson, Caramel Box, Circus, Da Capo, Demon Master Chris, Edelweiss, harukoi otome, Kira Kira, Navel, Nyaatrap, OtoBoku, OVERDRIVE, Really Really, Sale, SCORE, Shuffle, Tick Tack, We Love Master. Good time for me to pick up Otoboku and the Edelweiss bundle.